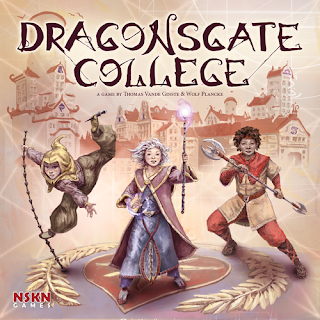 A legendary university of apprentices of the art of dungeoneering has started a new year of classes. As the head of one of the Student Houses it is up to you to uphold its proud traditions, and prove beyond doubt that it is your House that should have its adventurers enter the Dragonsgate that leads into a legendary dungeon nobody has returned from! 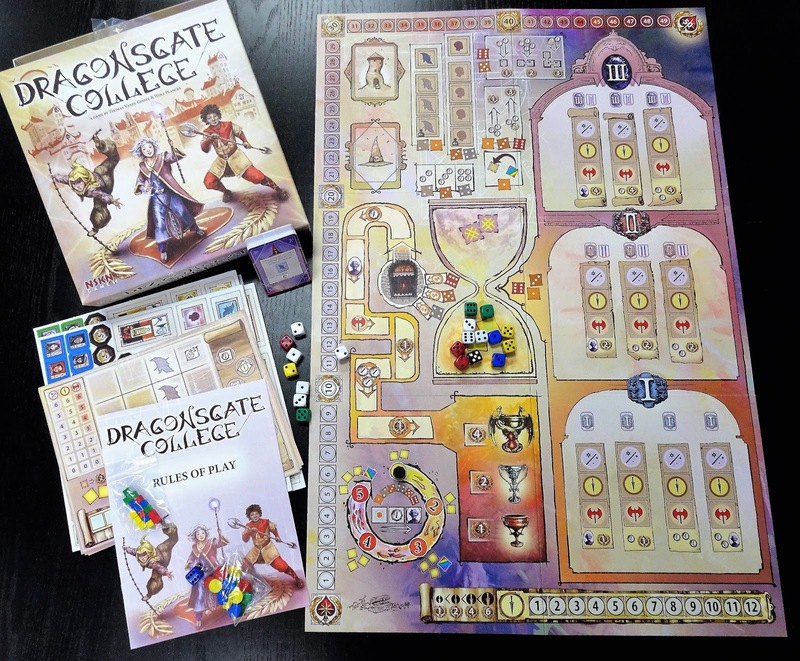 Dragonsgate College is a 2 to 4 player game of dice drafting and board building. 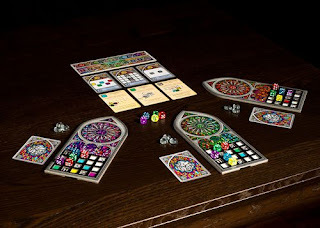 Each turn players will allow them to perform actions, like recruiting new apprentices and professors, raising new buildings on their House's grounds, or making progress within the gauntlet of the training dungeon. 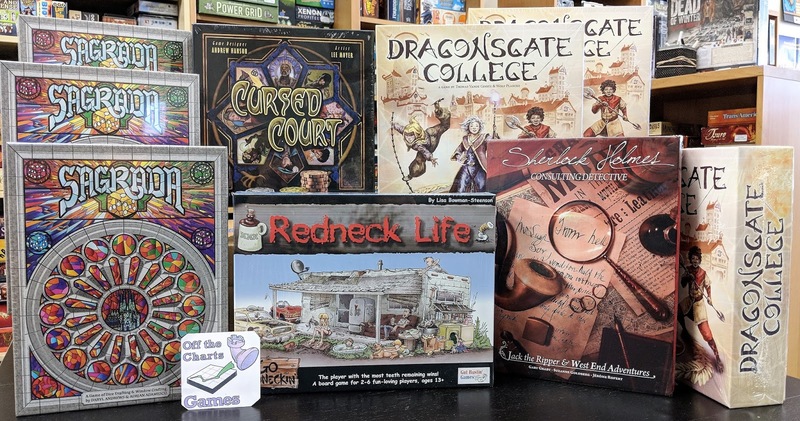 You will make mere apprentices into true masters of dungeoneering and collect the records of their achievements in you Hall of fame. you will further you House's interests by Stealth or by amazing discoveries in the field of Sorcery. 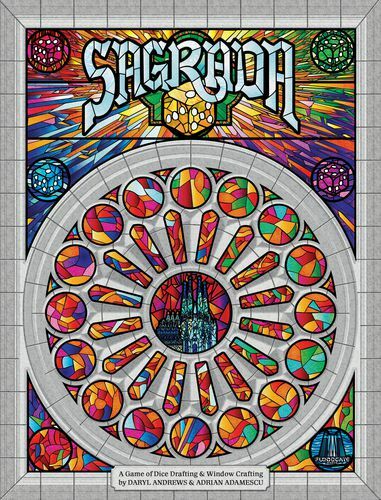 And when five turns pass, you will score all of your Prestige to see, whose name will be remembered - and whose House will be revered by everyone as the most prestigious. 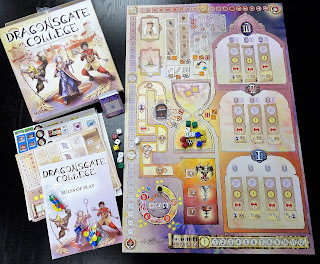 We have an open copy of Dragonsgate College available for you to play when you come in. 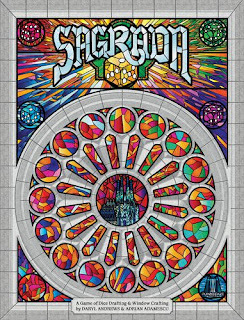 Sagrada is a dice drafting and window crafting game for 1 to 4 players that plays in 30 minutes. Players will draft and place dice to match their individual player's board window pattern obeying color and number placement restrictions. Public Tool cards will be available for players to spend favor tokens in order to use it's special ability. Three randomly selective public objective cards and an individual private objective card will drive the strategic placement of your dice.